DevOps is a topic we have all been hearing a lot about lately. 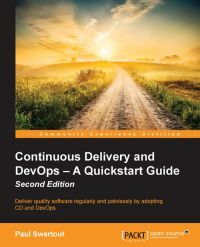 When I was contacted by Packt publishing whether I am interested to review their latest book on the subject (Continuous Delivery and DevOps - A Quickstart Guide - Second Edition by Paul Swartout), I decided to grab the opportunity and learn more about the subject in a more structured way than blog posts and podcasts can provide. It turned out this was mostly a book about soft skills, with technical topics not being in the forefront. There were a couple of tools mentioned, and the importance of monitoring and metrics was strongly pointed out, but I expected more than that. I might be a bit biased due to my engineering background, though. A common thread through all the chapters is a story about a fictional company which successfully implemented DevOps. It serves as an example of the journey and the practices involved. Probably the most important message it tries to get across, is the fact that there's no such thing as DevOps in a box: you can't buy it or just hire an expert - everyone needs to live it and breathe it. In the end the book falls a bit short and remains just an overview of methodologies and approaches, with lots of pointers to further resources. Although, not really actionable on its own, it is still a good starting point to learn about DevOps: what it is and why you might want to take on the task of implementing it.